Chris Ashton has scored three tries in three games for Saracens this season. England winger Chris Ashton has been attacked with a glass during a night out with his girlfriend in London. 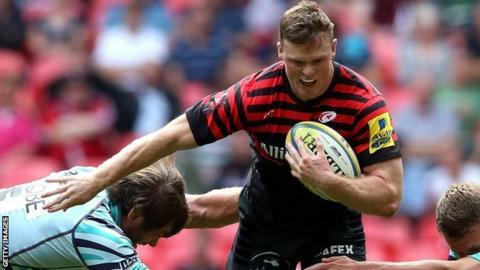 Ashton, 25, who played for Saracens in a 9-9 draw with Leicester at Wembley earlier on Saturday, was not seriously hurt and the police are not involved. "Some bloke decided to spoil an evening out for me and my missus. No stitches needed," Ashton wrote on Twitter. Saracens chief executive Edward Griffiths said: "He is not in trouble at all and showed admirable restraint." He added: "It is a reality that well known sports people are provoked by strangers and subsequent events are instantly tweeted. "People will inevitably see this story and say an England rugby player is in trouble again. "On the contrary, he was celebrating an anniversary with his girlfriend." Ashton was with fellow Saracens players, their wives and girlfriends, when a stranger approached them and began an argument. "A brief altercation occurred, which resulted in a friend of this stranger attacking Chris Ashton with a glass," a Saracens statement read. "The Saracens winger suffered two minor cuts on the left side of his face, but neither required stitches."